Hutch Brothers Concrete has over 50 years combined experience. We service all aspects of concrete work for both residential and commercial construction and are known locally for our innovative design and build capabilities. Hutch Brothers Concrete is committed to providing a green and sustainable building option. At Hutch Brothers Concrete our goal is to provide each client with concrete work that is strong, durable and long lasting. We are committed to quality and believe that customer service should be a business’ number one priority. To learn more about our concrete services and how we can help you realize your residential or commercial construction and landscaping goals, please contact us by telephone, email, or via our contact page. We look forward to meeting you soon! We at Hutch Brothers Concrete Corp know the consumer has a choice when selecting a quality concrete contractor. We pride ourselves on offering not only the highest quality customer service from start to finish, but also value added throughout every stage of your project. We provide detailed estimates so you know exactly what is included in our price. We vibrate our foundation walls for added strength. We break form ties so the foundation walls can more effectively accept insulation material. Did you know 6 mil poly will dry rot after several years? We educate our customers about more efficient Radon and vapor barriers. 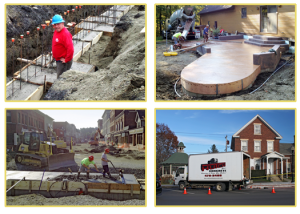 We know the type of reinforcement required for your project and investment to withstand our harsh Vermont winters. We attend national tradeshows, conventions, and certification classes in order to continually increase our knowledge about new products, tools, and procedures. We look forward to working with you and servicing your commercial and residential concrete needs.